Keep your kitchen trendy for years to come! Dark and moody tones are gaining momentum as they make their way into our kitchens. 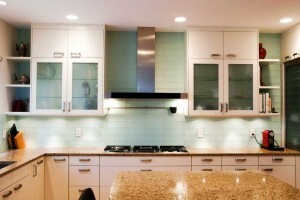 For instance, to create a darkened room that doesn’t evoke feelings of anger, go for forest-green cabinets. Complement these darker cabinets with simple white marble countertops to achieve a refreshing take on a moody look. Speaking of cabinets, lately, wood slat cabinets have become all the rage. Raw natural woods are becoming more and more popular these days and for good reason. Homeowners looking to create a minimal kitchen workspace run towards wood slat cabinets for their functionality and aesthetic. Combining a minimalist approach with great woodsy style, wood slat cabinets are the perfect solution for those who desire clean lines and rustic appeal. Kitchens require storage. More and more homeowners are turning to the vertical kitchen space to create built-in storage solutions. A seamless way to declutter a kitchen is with the addition of floor-to-ceiling built-ins in your next kitchen remodel. Just like moody hues, kitchens are using a single color and adding interesting elements with various takes on that same hue. This effect on the eyes is one that continues to fascinate homeowners alike. By using varying tones of the same color, your eyes can start to rest, allowing you to feel comfortable preparing meals in your new kitchen. No matter how much we may fight it, subway tile will never go away. It’s the one trend that seems to come back year after year. But lately, the subway tile trend has been altered just a little to not only serve as a magnificent backsplash but to envelop the whole wall. By creating a subway tile that goes all the way up to the ceiling you provide your kitchen with a look that guarantees you will never want to leave your kitchen. This entry was posted on Thursday, February 9th, 2017	at 1:05 pm	. You can follow any responses to this entry through the RSS 2.0	feed. Both comments and pings are currently closed.